As with medicine, marketing has changed drastically in the last 75 years. This is an examination of the history of dental marketing, broken into five parts. During the Industrial Revolution, marketing was strictly informational, not visual. An ad for a new medicine ran in 1938 with the bold headline, “Texan Universal Pills.” What follows is an article-length description of the medication, what ailments it treats, and how best to take it. The only image is of a single star under the word “Texan” in the headline. The rest is text, and tiny text at that. 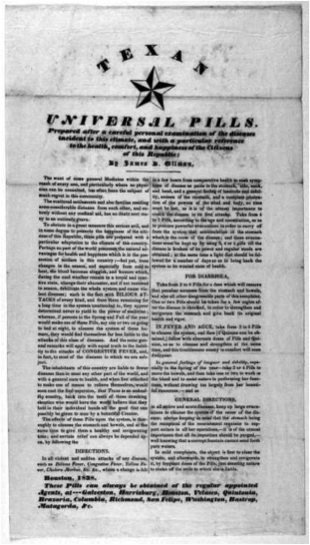 As was also common in that era, the ad features the voice of the medical expert: “…the object is first to clear the system, and afterwards, to strengthen and invigorate it…” We do not hear any patient viewpoint. This was the first iteration of push advertising, communications targeted at what the reader needs according to someone else’s expertise. It conveys not what the reader wants or feels, but what is needed from the expert’s perspective. The focus didn’t shift to the individual until the mid- to late-20th Century, particularly during the Civil Rights and Women’s Liberation movements. It’s no accident that lifestyle advertising emerged at the same time that America became obsessed with individuals’ freedom. 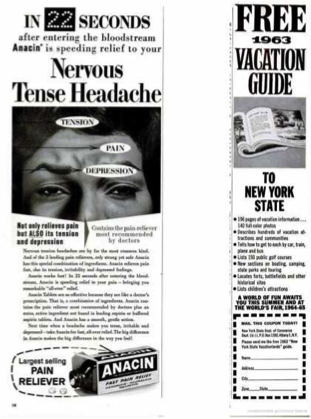 A 1963 ad for Anacin shows a woman’s furrowed brow, wrinkled by her painful headache. “In 22 seconds after entering the bloodstream, Anacin is speeding relief to your nervous tense headache.” We see less about the doctor’s expertise, more about the patient’s relief. The Information Age came about with the adoption of the personal computer in the late 1970s, and evolved with the Internet in the 1990s and the emergence of e-mail around 2000. Push advertising took on a third form called new media. Thousands of internet-based companies led to the dramatic rise (Dot-Com Boom) and fall (Dot Bomb) of the stock market. Even brick-and-mortar businesses erected websites to peddle their wares and services. It was popular to cram as much information as possible onto the website, sometimes onto a single, long-scrolling webpage. This became information overload. It was still push advertising, but preaching online what fits the reader. No true engagement quite yet. Enter the Age of Empowerment in advertising and marketing. Seemingly overnight (but really during 2002-07), the Internet was overtaken by the voice of the consumer, and the voice of the expert faded into the background. It wasn’t just happening on the web – all forms of media were affected. This was startling, disruptive and destructive to businesses in almost every industry, including dentistry. Newspapers and magazines began seeing rapid declines in their readership. Marketers struggled to figure out this “new way” to promote services and products. Dentists in private practice panicked that patients now had the power to say anything about them online. Suddenly every professional was tasked – on top of everything else they were doing –with posting relevant information on their website and using online marketing tools to attract the right clientele. Besides a good website, everyone needed search engine optimization (SEO), a social media footprint on Facebook and LinkedIn, and a blog (what on earth was that?). It seemed everyone was in a tailspin over how much time and money it was all going to take. Perhaps the worst fear was that consumers were now the voice of our brands! This is pull marketing, in which patients choose to join your circle because they feel strongly that they belong there. Pull marketing invites patients who have the most in common with the practice to become part of the circle as an exclusive club. It conveys that patients are part of a conversation with the dentist. It is an exclusive invitation that attracts only the ideal patients. Since much of pull marketing happens online, it is more measurable than traditional marketing that happens on radio, television, and in print. Pull marketing is more cost-effective. It’s all about being in the right place at the right time rather than papering the world with a canned message that came off the shelf. Higher efficiencies add up to lower costs. Pull marketing is a more natural social interaction, like hosting an open house online. It’s one of the best ways to attract like-minded patients, those who accept treatment and pay on time. Pull marketing yields better results because it’s about attraction rather than coercion. Pull marketing features the voice of the consumer, and that makes some dentists nervous. Worry not. Remember that the voice of the patient of the high-integrity practice is most often a voice of praise. Embrace pull marketing, and your practice will thrive for generations to come.